Now that we can open and close a connection to the database with PDO, we can make use of it for what databases are made for, storing and retrieving information. The simplest form of query is the PDO query method. As the name suggests, this is used to perform database queries. Before we begin to query a database, lets create a small database with a table for animals. This will be a MySQL database for use throughout much of this tutorial. Remember, because PDO provides a common set of tools for databases, once we have the correct connection, the rest of the code is the same, regardless of the database you choose. When using PDO to query a database, the function used to do so depends on the statement you wish to send to the database. Below we will see three queries on how to INSERT, SELECT and UPDATE. The output of the script above will look like this: Connected to database 1 This shows us that we connected successfully to the database and then we have displayed the number of affected rows. PDO::exec returns the number of affected rows if successful, or zero (0) if no rows are affected. This may cause issues if you are checking for a Boolean value and why it is recommended using === when to check for type also, as zero (0) may evaluate to Boolean FALSE. The PDO::exec method should be used for SQL statements that do not return a result set. We could use this same method to INSERT many more animals to our database, but a more efficient method would be to use a transaction. This is covered in the section on Transactions. You will have noticed that we can iterate over the result set directly with foreach. This is because internally the PDO statement implements the SPL traversble iterator, thus giving all the benifits of using SPL. For more on SPL refer to the Introduction to SPL page. The greatest benifit of this is that SPL iterators know only one element at a time and thus large result sets become manageable without hogging memory. Once again we see that the connection is made to the database and one row is affected as now the kiwi has become a true Australian like the rest of the creatures. PDO::exec should be used for all database queries where no result set is required. The section above showed how using PDO::query we can fetch information from the database. 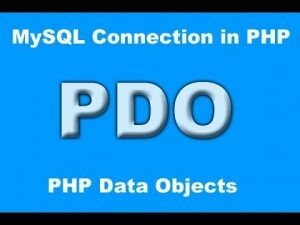 The PDO::query method returns a PDOStatement object that can be utilized in much the same was as mysql_fetch_object() or pg_fetch_object(). Of course there are times when an numerical index is needed or an associative index. PDO::query provides for this also by allowing the coder to set the fetch mode for via the PDOStatement object or via PDOStatement::setFetchMode(). To fetch an associative array from our results the constant PDO::FETCH_ASSOC is used and returns the column names as indexes or keys of the resulting array. PDO has returned the results as a PDOStatement object that we can iterate over directly. The resulting indexes are the names of the fields within the animals database. Like PDO::FETCH_ASSOC, the PDO::FETCH_NUM produces a numerical index of the result set rather than the field names. There may be times you need to fetch both numerical and associative indexes. PDO::FETCH_BOTH produces a numerical and associative index of the result set so you can use either, or both. Now we see the results have included both indexes. This little gem takes the result set and returns it as an anonymous object or stdClass and maps the field names from the database as object properties with the values the values of stored in the database. The use of the field names as class properties makes integrating results into an Object Oriented envioronment simple. PDO::FETCH_LAZY is odd as it combines PDO::FETCH_BOTH and PDO::FETCH_OBJ. I am unsure why you would want to do this, but it must have been important enough for somebody to create it. The code below is that of PDO::FETCH_BOTH and is reproduced here for examples sake. The above code will give a result the same as that of PDO::FETCH_BOTH. Genius! PDO::FETCH_CLASS instantiates a new instance of the specified class. The field names are mapped to properties (variables) within the class called. This saves quite a bit of code and speed is enhanced as the mappings are dealt with internally.